Father Jacques Hamel was killed by ISIS sympathisers at a church last Tuesday. Hundreds of people attended a funeral for slain French priest Father Jacques Hamel at the Cathedral in Rouen. ROUEN, France (Reuters) - Mourners crammed into Rouen Cathedral on Tuesday for the funeral of the Roman Catholic priest knifed to death at his church altar, as France’s political leaders sought ways to defeat home-grown Islamist violence. Father Jacques Hamel was leading morning mass in the nearby industrial town of Saint-Etienne-du-Rouvray last Tuesday when the attackers stormed in, forced the 85-year-old to his knees and slit his throat while chanting in Arabic. Amid tight security at the thirteenth century gothic cathedral in northern France, a procession of senior clergy followed pallbearers who carried Hamel’s coffin through the “Door of Mercy” and placed it on an ornate rug before the altar. 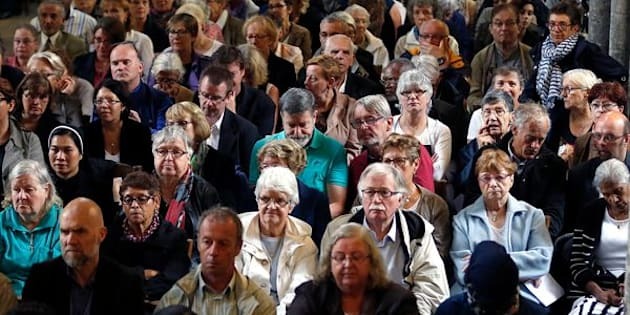 The priest’s sister, Roselyne Hamel, told the congregation how during his military service in Algeria her brother had refused an officer’s rank so as not give the order to kill, and how he once emerged the sole survivor in a desert shootout. “He would often ask himself: ‘Why me?’ Today, Jacques, our brother, your brother, you have your answer: Our God of love and mercy chose you to be at the service of others,” she said. The service was to be followed by a private burial. The service, which took place amid tight security, was to be followed by a private burial. Hamel’s murder by French citizens was the first Islamist attack on a church in western Europe and came just 12 days after a Tunisian who had pledged allegiance to Islamic State drove his truck through a crowd of Bastille Day revelers in the Riviera city of Nice, killing 84. Islamist militants have killed more than 200 people in France since January 2015. Facing strong criticism from right-wing opponents over its security record, the Socialist government has warned of a long war against militant Islam at home and abroad in places such as Iraq, Syria and Libya. Prime Minister Manuel Valls has said the state must reinvent its relationship with the “Islam of France”. France’s Muslim minority, the European Union’s largest, makes up about 8 percent of the population. Hamel’s coffin was carried into the thirteenth century gothic Cathedral through the “Door of Mercy” and placed on an ornate rug before the altar. Since the 1980s, successive governments have tried to nurture a liberal Islam that would better integrate the faith into French society. Meanwhile, the Muslim community, riven by divisions and power politics, has struggled to oppose radical Salafist groups that have established their presence in some mosques and neighborhoods as well as on the Internet. Valls wants to ban foreign funding for mosques and says all French imams should be trained in France. His interior minister, Bernard Cazeneuve, said that a foundation that would enable the secular state to finance cultural centers linked to places of worship would be established by the end of the year. “We must guard against being paternalistic but we must have the lucidity to recognize that there is an urgency to helping ‘Islam of France’ get rid of those that undermine it from within,” Valls told the weekly Journal du Dimanche. Some Islamic leaders have expressed doubts over the government’s plans. Cazeneuve, whose portfolio includes religious affairs, said on Monday that the Socialist government had shut down about 20 mosques and prayer halls in recent months and that more closures would follow based on intelligence in hand.